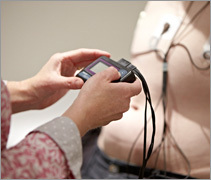 Holter monitoring is form of extended duration ECG monitoring that is used to capture recordings of abnormal heart rhythms that may be transient in nature. Transient disturbances in the heart’s rhythm may be suspected because of symptoms of palpitations and/or other less specific symptoms such as lightheadedness, shortness of breath, chest discomfort, fatigue and reduced exercise capacity. The ability to record the heart rhythm over a period of 24 hours increases the likelihood of obtaining diagnostic information that can direct appropriate treatment. Adhesive ECG recording electrodes are positioned on the front of the chest. One end of the monitor’s wires are clipped to the ECG electrodes and the other end is plugged into the monitor, itself. The Holter monitor is about the size of a mobile phone and is clipped to a belt or a strap that can be worn around the neck or over the shoulder. Recording is continuous over a 24 hour period after the monitor is attached. During this time it will not be possible to take a shower or bath as the device is not waterproof. The monitor is returned to the office 24 hours after the device is attached so that the recordings can be transferred to a computer for analysis. Once the recordings have been analysed and verified, a report is forwarded to the doctor requesting the test – usually within 48 hours.